Awards celebration brings together local filmmakers, active duty and military veterans during San Diego’s only military film festival. SAN DIEGO – Oct. 24, 2017 – On the evening of Saturday, Oct. 21, 2017 the GI Film Festival San Diego announced the winners of the Local Film Showcase in eight categories. More than 100 people attended the soiree hosted by comedian and former U.S. Navy Officer, Jamie Kaler, and featured entertainment by the American Flyboys. A film of any genre or topic made by a local filmmaker who is currently serving or has served in the U.S. military. Local filmmakers should reside in San Diego County or Imperial County. Local veterans and active duty military were invited to submit entries on any topic. Local student and professional filmmakers with no military background were invited to submit films with a military theme. Any (national or international) filmmakers were invited to submit a film on military subject matter based in San Diego County or Imperial County. The 2018 GI Film Festival San Diego is scheduled for Fall 2018. For up-to-date information on the festival and to be notified of the film submission process for 2018, visit www.GIFilmFestivalSD.org. The GI Film Festival San Diego is one of only a few film festivals in the entire United States to exclusively feature stories for, by, and about military service members and veterans. Films selected for this year’s GI Film Festival San Diego featured diverse stories with themes ranging from women in the military, resiliency and recovery, transitioning, and the LGBTQ+ community. Selections also highlight military experiences from within the Hispanic, African American, and Asian cultures. Wars covered in the films span from World War II to the present day conflicts. Films came from around the United States as well as here in San Diego and included feature length films to shorts. The 2017 GI Film Festival San Diego featured 33 films in all, including two World Premieres and eight West Coast Premieres. There are also filmmaker appearances and panel discussions. Screenings were presented in themed film blocks so audience members can fully immerse themselves in the festival experience. 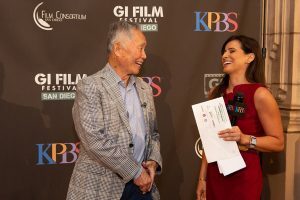 The GI Film Festival San Diego is organized by KPBS in partnership with the GI Film Group and Film Consortium San Diego. Official sponsors of the 2017 GI Film Festival San Diego include Kaminskiy Design and Remodeling, City National Bank, Lewis University, National City Mile of Cars, Altus Schools, Bob Baker Subaru, and GEICO Military with additional support from Scatena Daniels Communications and the Maritime Museum. Alaska Airlines is the official travel sponsor.